Riding in Malibu Creek State Park. This park, and all other State Parks in the Santa Monica Mountains, will be closed to help balance the budget unless there is a large public outcry. The fine for trespassing in a closed State Park is reported to be several thousand dollars. On Wednesday, June 10, the California Coastal Commission will take up a Santa Monica Mountains Conservancy proposal (MAL-MAJ-1-08) to provide more trail recreation, public access and camping opportunities. Most of this concerns the planned, multi-use Coastal Slope Trail. The City of Malibu is opposing this proposal and offers its own (MAL-MAJ-3-07) that has fewer trails, fewer trail connections, and a prohibition on camping. While Coastal Commission staff support the Conservancy position, there will be plenty of opposition. Any and all who can attend and support the Conservancy please do so. A meeting at LA City Hall for community input into the new LA city bicycle master plan, which includes considering mountain bike access to city parks, was held on April 15. CORBA representatives attended this meeting to give their comments, as did a number of equestrians and Sierra Club leaders who are opposed to off-pavement cycling in the city. We have put together the LA City Parks web page to show what happened at this meeting and to explain the greater issues surrounding it. We were able to videotape the meeting and have put together video clips of some of the testimony so you can see firsthand some of the outrageous things other trail users in LA are saying about mountain bikers. The page is a work in progress so check back for more video clips and details of the events as they unfold. The Angeles Chapter of the Sierra Club has reaffirmed their complete opposition to off-pavement bicycling in LA in an article in this month's edition of the Southern Sierran. 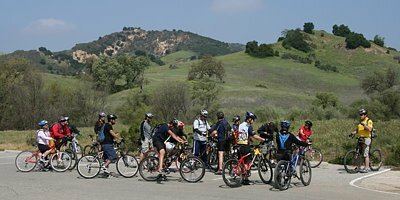 The Santa Barbara Mountain Bike Trail Volunteers would like to let everyone know about the trail closures in the SB Front Country as a result of the Jesusita Fires, and request your assistance getting the word out. I know many of you come up to enjoy these trails, so we need your help ensuring their recovery and continued access to mountain bikers. All of the Front Country trails located within the Los Padres National Forest between Refugio Rd to the West and Cold Springs Trail to the East are closed to all access. This includes bikers, hikers, runners, and equestrians. Specific trail closures include Jesusita, Tunnel, West Fork Cold Springs, Arroyo Burro (frontside), and Tuckers Grove. Tunnel, Jesusita, and Arroyo Burro trails are almost 100% covered in rock slide debris and "ravel" - the baked and loosened top layer of soil. Fortunately, the Romero trail complex and a few others remain open. However, since these are some of the few trails open they are seeing significantly more use, especially on weekends. Please keep this in mind and ride courteously and cautiously. SBMTV strongly encourages riders to ride with bells. We've placed bell boxes at the top and bottom trailheads if you don't have a bell or forgot yours. Unfortunately, a small number of trail hikers, bikers, and runners have been ignoring the closures. Local anti-mtb voices are using this as justification for efforts to ban mtb's from Front Country trails. Tunnel Trail has long been under the gun for closures. With reports from local Sierra Club members that downhillers have been spotted on the burned-out Tunnel Trail, mtb'ers now find ourselves on the defensive. Please help us discourage anyone from using the closed trails until they re-open. A HUGE volunteer effort will be needed to recover these trails, but it can and will be done. In fact, we have an opportunity to repair these trails to be more sustainable in the long-run. Please consider helping those efforts when they arise. In the short-term, however, we need to give fire and cleanup crews the space they need to mop up, then give the trails time to recover before going in and rebuilding. With so much great riding still accessible in the SB backcountry, it shouldn't be too hard to give the Front Country trails a breather. Please help us spread the word. If you have any questions or comments, or would like help selecting alternative rides in the area, please feel free to shoot me or anyone else from SBMTV an email. I can be reached at rick.margolin@gmail.com, or check out www.SBMTV.org. California State Parks has announced a proposal to open singletrack for mountain biking in Marin County, on the shoulders of Mt. Tamalpais. The agency plans to permit bicycle use on the 4-mile Bill’s Trail segment and is soliciting public commentary on the project. "I'm urging mountain bikers across the country to send comments in support of this project," says IMBA Executive Director Mike Van Abel. "It's hard to imagine a more important location than Marin, where mountain bikers have worked incredibly hard to regain access to the very trails that helped bring our sport into the world." Take Action! Tell California State Parks you support their decision to open Bill’s Trail to bicycles. The commentary period ends on June 26. Use this online form to provide your support! For more information and pictures, visit the IMBA Bill's Trail Page. 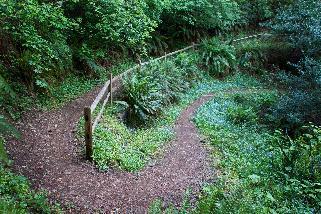 June 6 - National Trails Day at Mount Wilson. We will join the Forest Service and other volunteer trail user groups to work on the trails around Mount Wilson in the Angeles National Forest. We will work on the trails until 1:00 pm and then a barbecued lunch will be provided for us. Details. June 6 - National Trails Day at Portuguese Bend Nature Reserve in Rancho Palos Verdes. This is your chance to work on trails with gorgeous ocean views. A free lunch will be served when trail work ends at noon. The first 50 volunteers to sign up with the Palos Verdes Peninsula Land Conservancy will receive a free REI T-shirt (please call 310.541.7613 x201 to make a volunteer reservation; you can leave a message if it's after office hours). Volunteers should gather by 9AM at Del Cerro Park (Map). For more information, visit www.mtbpv.org. Wear a long sleeve shirt, long pants, sturdy shoes. A hat and sunblock are also recommended. It could be cool and misty so bring a jacket, too. May 23 - SMMTC trailwork on the Secret Trail in Calabasas. A few CORBA volunteers helped the Santa Monica Mountains Trails Council with this trailwork. View the photo gallery here. Congratulations to CORBA-PV members Troy Braswell and Dave Sakai, who were 2 of the first 3 graduates from the Palos Verdes Land Conservancy Volunteer Trail Maintenance Training class. During the past year, Troy and Dave met the minimum 50 hour training requirement, and passed the final test. The training involved a 6 hours in the classroom followed by monthly sessions that focused on technique and skill-building in key maintenance areas. Field sessions included detailed hands-on treadwork, water diversion, rock work, basic survey, brushing, pruning, tool use and safety. Each student must demonstrate a working knowledge of the subject areas and the associated skills to perform the tasks in order to qualify as a trained volunteer. As trained volunteers, Troy and Dave are able to plan and perform maintenance tasks in the Palos Verdes Nature Preserve areas. 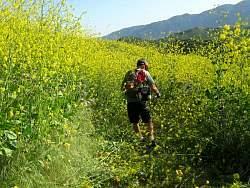 Mustard growth is a continuing problem on many local trails. It is particularly troublesome on the New Millennium Loop Trails in Calabasas. Last year the CORBA trail crew volunteers labored to cut down the mature mustard and remove the debris from the trail (photos). It was a daunting task. In the end, the land manager, Mountains Restoration Trust (MRT), had to deploy additional resources to complete the job. It was so difficult they decided in the future to destroy the young mustard plants before they had the opportunity to overtake the trail. This year, because of the state of the economy, the MRT was not able to afford to do this, so CORBA donated $500 to help pay for labor and supplies. The trail crew also hauled supplies up to the trail that were needed for the task. Next time you ride on the New Millennium Loop Trails, remember to thank CORBA and MRT for removing the mustard! The draft Los Angeles Bicycle Plan Maps are available for public review and comments. They are posted on the LA Bike Plan website ( www.labikeplan.org ) and hard copies will be distributed to regional libraries, planning offices, etc. as indicated in the attached letter. The full bicycle plan (text and maps) will be circulated for public review upon completion. Save the Date! Southern California’s largest MTB event! Ride, Eat, Win! The FTF Committee is looking for volunteers for some of our new events this year. To lend a hand, email us at ftf@corbamtb.com. Sponsors & exhibitors: to secure your spot & maximize your FTF benefits, contact us at ftf@corbamtb.com. Saturday June 6 is the next skills clinic.